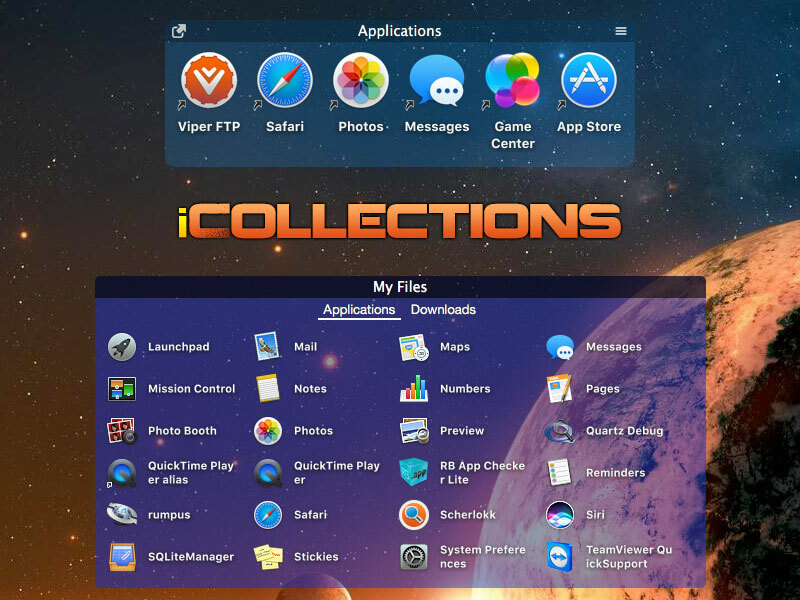 iCollections is a skillfully designed application that helps keep your Mac organized as you would a physical desk at your workstation. It is intended to take your organization process to a level that makes your desktop neat and very attractive. iCollections requires macOS X10.10 Yosemite and fully compatible with macOS High Sierra. It allows for the creation of collections for organizing desktop items, disk panels for disk drives, folder views for folders and even photo frames for favorite images all accessible from the desktop. With few clicks, the icons, files, and folders on your desktop will get grouped according to your preferences. Thus, the days of scouring your desktop for a particular application are over. Just get started by creating a new Collection by accessing the iCollections main menu from the system toolbar. iCollections is fully integrated with your macOS such that it launches immediately on start up as this is the default option which you should choose, thus allowing you to concentrate your mental energy into your work straight away. iCollections allows you to view all drives connected to your Mac without having to navigate to be sure whats been connected and whats not with its Disk Panel and therefore gives you the right to filter what disks that you see. The need to open your browser to check out that instant chat that just came in that cant wait, or the new video that just dropped from your favorite artist is now easier with iCollections. As it helps you view and keep in constant touch with the website you are most active on, without opening your web browser from scratch. iCollections boasts of a very detailed customization setting for its appearance.